Multiethnic colleagues talking at office meeting. Happy young business people developing partnership agreement 4K. Multiethnic business people collaborate in modern loft office. Young happy colleagues smiling, discussing project 4K. Happy dark-skinned businessman talking on phone. Successful afro-american mananger talking on cell phone and smiling on blurred background. Happy European business people smile cheerfully at office table, discussing work with multiethnic partners slow motion. 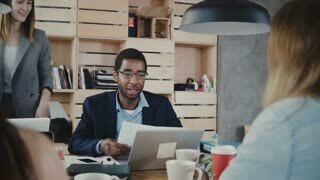 Happy businessman with his female partner smile, discuss work at multiethnic healthy office team meeting slow motion. 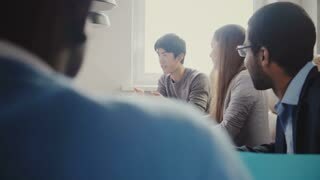 Happy confident Japanese young freelance businessman sharing ideas, smiling at multiethnic office meeting slow motion. 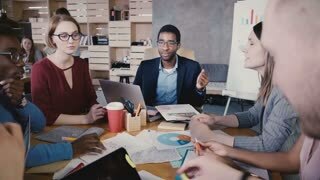 Happy multiethnic young group of business people sit together by the table, discuss international partnership and smile.